Today, Ubisoft announced The Battle Hardened DLC pack for Assassin's Creed III! The Battle Hardened, is now available on Xbox 360 and will be available on January 9th on PlayStation 3 and January 15 on PC. The pack is available for £7.99 on PC and PlayStation 3 or 800 MSP on Xbox 360. All Assassin’s Creed III downloadable content packs will also be available on the Wii U in the future. 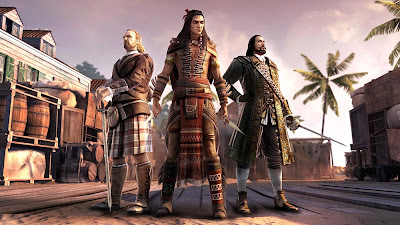 - Three Multiplayer characters including the influential Governor, the resilient Highlander and the fearsome Coyote Man. The Battle Hardened pack is included in the Assassin’s Creed III Season Pass, which includes all five downloadable content packs to gamers owning the original game. The Season Pass provides more than 25% savings versus purchasing the DLC separately. Assassin’s Creed III Season Pass is available for purchase for 2400 MSP from Xbox LIVE or £23.99 on the PlayStation Network.